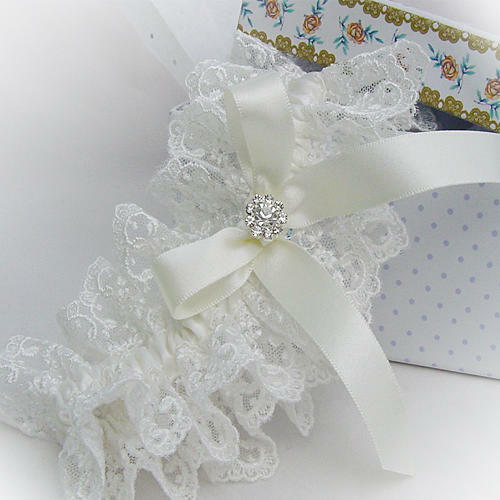 Hello, I'm Catherine, designer/maker since 1984, besotted with lace, passionate about quality and I’m thrilled to help you find your perfect wedding garter! If you let me know your order is urgent, I can make sure it arrives quickly. I made my own wedding garter (and wedding dress) in 1989 and have continued designing gorgeous garters ever since! 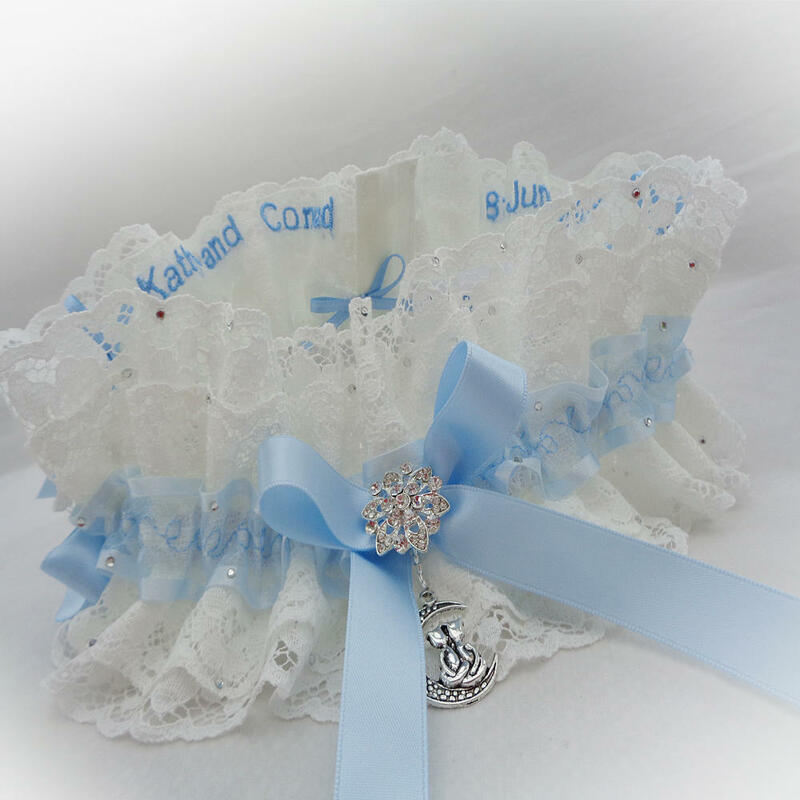 I can take your sentimental items and incorporate them into a garter that is precious and unique to you. Over the years I have built up a wonderful range of suppliers for the most gorgeous Nottingham lace and fabrics…You have a huge range of ribbon and embroidery colours to choose from too. I have a gorgeous workshop in the beautiful Bedfordshire countryside, nr Silsoe, just a stones throw from the lovely Georgian stately home Wrest Park, now run by the National Trust. 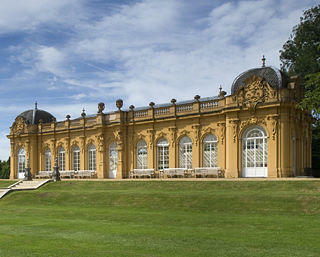 (Lily Allen’s ‘The Fear’ video was shot here). My Dad had no idea about fashion so by the age of 12, I was sewing all my own clothes, by hand, because my Dad didn’t think I was old enough to be ‘safe’ unsupervised with the sewing machine! My sister had a Saturday job in the local fabric shop and all my pocket money was spent in there. Skirts, blouses, dresses…. that was a lot of backstitch, it probably gave me the love of hand sewing I have now. By 15 I thought I wanted to be a fashion designer and went on after school to do a Diploma in Fashion Design. I was working Saturdays at a lingerie store, and decided I to set up my own lingerie brand, custom making lingerie and nightwear, grand plans for a teenager ;-). When I left college I shared a shop with a dressmaker and a tailor. We each had our own workroom and display, which was lovely, but I outgrew the space and had to move to my own premises. Two years later I moved to the neighbouring town and opened ‘Sweet Nothings’ just off the high street. I had fabulous staff, Linda had trained as a corsetiere in her teens and was a great asset, bra measuring and fitting and organising the models when we took part in Wedding Exhibitions and charity fashion shows. My sister Mary and her daughter helped too, in the shop and with the wedding exhibitions. At one of the wedding shows, my nightwear designs were on the catwalk, and by lucky chance the buyer from Moss Bros in Covent Garden was there and decided to buy a collection for their store. (At the time they were experimenting with ladies nightwear for Christmas gifts...). After that I was designing for several lingerie boutiques in England and Scotland. In 2002 I set up the website Sweet Nothings Lingerie to run side by side with the shop, but when my eldest started school, Linda wanted to retire and I decided to close the shop to be able to take them to and from school and be involved in their activities. We had been there 16 years and a lot of our customers had become good friends. 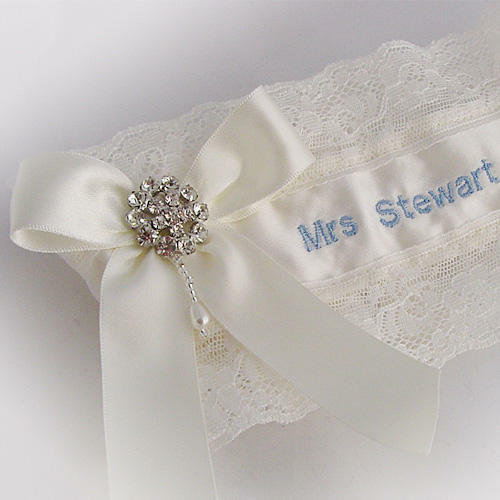 The website did well, but I loved my sewing and was getting more and more orders for custom made garters and I decided to launch www.silkgarters.co.uk dedicated to luxury bridal garters. The response was phenomenal and Mary’s daughter in law decided to take on Sweet Nothings, leaving me free to concentrate on Silk Garters. I've supplied the ITV 'Loose Women' show with my blue and white personalised garter, embroidered with the words 'Loose Lady' and on Coronation street, 'Becky' Katherine Kelly wore one of my custom made garters in pink silk, embroidered with the words 'Good Luck'. I hope you enjoy browsing my Silk Garters website. If you need any advice on choosing a gift I'm just a phone call away. For your convenience you can now buy securely online. Stock items are sent out next day first class, however I can't hold all items in stock, there are nearly 100 designs on the website with different colour and size choices too. If your order is urgent please contact me, call and leave a message or text 077 8080 1102 and I'll get back to you asap. Special order /personalised items may take up to 10 working days for dispatch. Then sent out by Royal Mail, first class, which may take 1-3 days. Special delivery is also now offered (although quite often not needed, please feel free to ring and check 077 8080 1102) and if you can't find what you are looking for please contact me, and I'll answer your queries ASAP.